1 In a deep bowl, combine eggs and soy creamer, season with salt and pepper, and puree until smooth with an immersion blender. 2 Rinse parsley, shake dry, pluck leaves and coarsely chop. Add to egg mixture. 3 Brush a small baking dish (about 250 ml or approximately 1 cup) with a little oil. Pour in egg mixture. Place baking dish in a roasting pan and add enough hot water to pan to come 1-2 cm (approximately 1/2 - 3/4 inch) up sides of baking dish. Bake in preheated oven at 150°C (fan not recommended, gas mark 1-2) (approximately 300°F) until custard has set but is still jiggly in center, about 40 minutes. 4 Meanwhile, combine chicken broth with 500 ml (approximately 2 cups) water in a pot. Rinse and dry asparagus, then trim woody ends and peel outer layer of stalks. Add asparagus trimmings to the broth. Bring to a boil, then simmer over medium heat for 10 minutes. Remove pot from heat and let stand to allow flavor to develop, about 30 minutes. 5 Remove baking dish from the water bath; let cool on a rack until custard feels firm to the touch. 7 Cook asparagus tips in a pot of boiling water that has been seasoned lightly with salt and sugar until crisp-tender, 3-5 minutes. Drain asparagus, reserving cooking water. Rinse asparagus in cold water and drain well. 8 Line a sieve with a clean kitchen towel. Pour asparagus-flavored chicken broth through sieve into another pot. Add asparagus cooking water as well; keep warm. 9 Run a sharp knife around the edges of the egg custard to loosen from baking dish, then invert onto a work surface. Cut into 1 cm (approximately 1/2-inch) cubes. 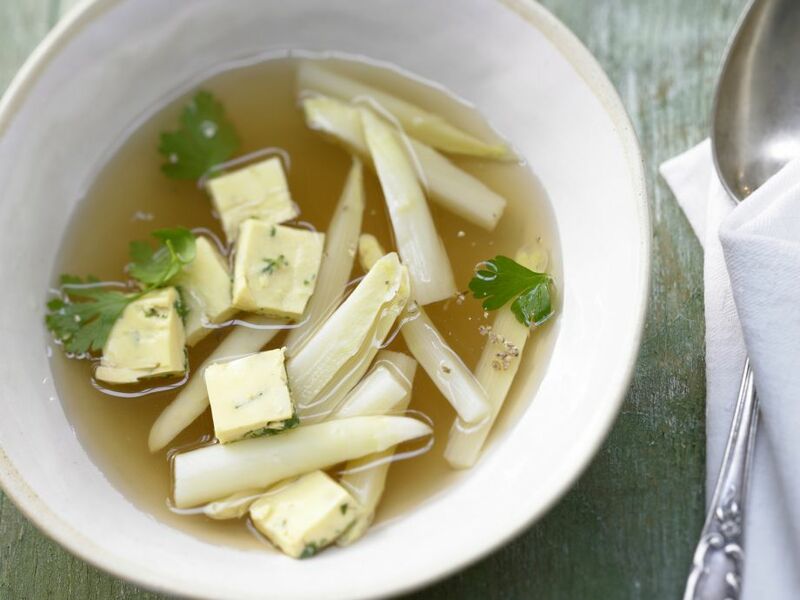 Add warm custard cubes and the asparagus tips to the broth. Serve soup immediately in warmed soup plates.